Those of you who have been following my blog for a while know that this has been quite a year. I think we all have the tendency to look back in late December, and cringe at the thought of all we’d planned to do but didn’t. I started to do that not long ago, but had to stop myself. 1. Published three books: Friend Grief and Anger: When Your Friend Dies and No One Gives A Damn; Friend Grief and AIDS: Thirty Years of Burying Our Friends; Friend Grief and 9/11: The Forgotten Mourners. 2. Kept this blog going, as well as my Facebook, Twitter, Pinterest, Google+, LinkedIn and Goodreads accounts. 3. Appeared on blogs such as DIY MFA, The Writer’s Guide to E-publishing, Choices, and Memoir Writer’s Journey. 6. Reviewed a dozen books for BroadwayWorld.com. 7. Participated in Printers Row Book Fair and Chicago Book Expo, as well as the annual ADEC (Association for Death Education & Counseling) Conference book fair. Along the way, I met some remarkable people. Some of them were people I interviewed for my books. Some of them were personal heroes, like the guys who started ACT UP in 1987. And while a recurrence of symptoms from my concussion four years ago was not in my plans, the forced slow-down (which you probably noticed from my less-frequent posts for the past couple months) has given me a chance to catch my breath. 1. Three more books in the Friend Grief series. One is on the military; one on grieving friends you work with. The final book will be stories of people (like me) who made major life changes at the death of a friend. 2. More posts here and on all the social media sites listed above. 3. More book reviews here and on BroadwayWorld.com. 4. More blog posts on Huffington Post. 5. More terrific guest bloggers here talking about how they faced grieving a friend. 6. 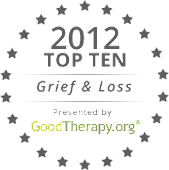 More related content, like free lesson plans/discussion guides for all the Friend Grief books. 7. A completely redesigned website. I couldn't have done it all without you, my readers. Your comments - on and offline - have kept me going when I was most frustrated. You are in my thoughts every time I sit down at the computer. I appreciate your support more than you know. And believe it or not, I already know what comes after those next three Friend Grief books. Viki, from this side of the blogosphere, it looks like you had a very productive year and most importantly, you made a difference. Take a bow. I can't wait to see what you write, how you connect, and the impact of your efforts on a lot of hurting people. Keep up the good work! You're one of those people I think about when I sit down to write. Hope to see you in NYC soon!